I don’t like eating out all the time because that usually calls for an unwanted stomachache and I don’t want to cook fast/unhealthy meals – so my fiancé and I finally came up with a solution. This past Sunday we found ourselves walking around our neighborhood, strategically planning our meals for the week. We decided we would prep things ahead of time so that we will still have time after work to go to the gym, take a yoga class or whatever else we may have planned and STILL eat a healthy meal! Yes this does take some thinking and prep work BUT it’s so much better then scrambling at the last minute and stressing all day over what you will feed your family! If you don’t already do this prep then I suggest you try it – it really does make life so much easier and it will free up those precious couple of hours (assuming you get out at 5) after work for you to get whatever you need done. It’s worth a try! Trust me… I understand that there’s not enough time in the day to be stressing over food so definitely give it a whirl – you’ve got nothing to lose! The truth is this: you can’t hide from tryptophan… I don’t know about you but every thanksgiving I eat the turkey dinner and am simply exhausted right after. Tryptophan is an amino acid found in all turkeys. If you don’t want the exhausted feeling like you’ve eaten for hours, then don’t eat the turkey! Even if you buy an organic turkey, the tryptophan is in the meat and can’t be avoided. If you don’t want to feel SO tired after dinner, (or during) then you should probably eat a small portion and cut back on the carbohydrates. The combo of the tryp and the carbs will really make you sleepy. Try to add veggies into the equation and hope for the best. I hope you don’t think you’re the only one who gets tired after thanksgiving… we ALL do! It’s only one day and you should let yourself enjoy great food with great people. If you want to bring something to your dinner check out my sweet potato pie recipe – that’s a definite winner! Have a great holiday and remember to spread the love as much as you can this thanksgiving. Neutrogena, NOT a life saver! I can’t explain how important it is to check the ingredients on ALL your products. Last week I really had an eye opening experience. We ran out of face wash and so the first move I made was to check underneath the sink to see what we had hiding. Well, I found a Neutrogena face wash and thought, “PERFECT!” I started using this face wash and didn’t think much about it. That week I had terrible blemishes. In fact, I hadn’t seen my face break out like that since high school, or even middle school! I continued using the face wash because I really thought it was helping me. It wasn’t until Friday afternoon when my fiancé said “wow that face wash really isn’t working for you” and I thought to myself… what in the world does he mean? Just because I have pimples doesn’t mean anything. Then I had an aha moment and went to read the ingredients on the back of the Neutrogena bottle. 3.5% Benzoyl Peroxide. There it was – the culprit. I couldn’t believe I had missed this important step. I am always so careful about reading the labels on every other product and this time I didn’t think twice about it since we already had it in the cabinet – I assumed it was fine! Well, my face really suffered from that wrongdoing and this week I am working on correcting the terrible effects. This is a perfect example of why it’s so important to be aware of what goes into your body AND onto your body. We usually use Desert Essence Thoroughly Clean Face Wash and I think I’ll stick with that! Next time we run out, I will use regular soap and water – that can’t do any harm… at least I hope not! Since I began to change my lifestyle habits, I’ve also made a change in many of the products that I use on a daily basis. I’d like to share one brand that I’ve been enjoying for a few months now. It’s called Desert Essence and boy is it fabulous. 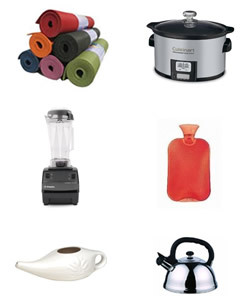 You will find many of their products at Whole Foods or other health food stores. They use tea tree oil in many of their products and frankly that’s why I like it so much. Tea tree oil is a wonderful, natural herb used in many different ways. 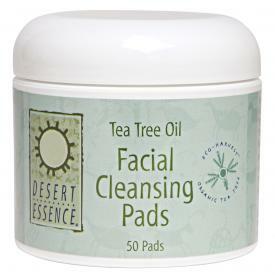 Yes the smell is quite pungent but if you buy their facial cleanser pads then rinse your face with water afterward, the smell will minimize. My fiancé loves using their jojoba oil after he shaves – it’s soothing for his face. In the past, I’ve tried changing deodorants to a natural brand like Tom’s but have always found that it would never last throughout the day. This always made me frustrated because I never wanted to use deodorant with aluminum but I also didn’t want to smell bad. I finally found my answer! Desert Essence deodorant! It lasts through the day AND it smells great. I hope you check out some of their products, I know you will enjoy them. It’s really important to check the labels on ALL your products including lotions, soaps, deodorants, toothpaste and anything else you use. Your skin is just as important as the rest of the organs in your body. If you’re going to change your food and lifestyle, then you may as well go all the way – that’s how I see it anyway. Treat your skin with care, it IS the largest organ in your body. Our society is constantly looking for ways to quicken every process up – especially cooking. That’s why they created the microwave oven – to have a quick meal and not have to worry about the long hours of standing around the kitchen. Well… I have lots of thoughts about the microwave oven. First off they say you can’t put aluminum AND plastic into it… WHY? Well, it’s because when you microwave those items, substances used in manufacturing them may leak into the food. That sounds nasty… Even though you can’t see any changes in the food it may be getting dangerous chemicals poured into it. That does NOT sound fresh and appetizing to me – and that’s why I stay far away from the microwave oven. I’m not trying to bombard you with my opinions on this issue, but I think it’s important that you know the facts. 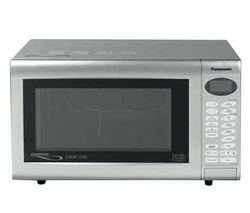 The microwave oven has only been around since 1946 when Dr. Percy Spencer created it – that means that we’ve only been exposed to it for 63 short years and quite possibly we don’t know the exact long-term effects of it. My aunt, may she rest in peace, died two years ago of pancreatic cancer. While she was battling the cancer she did a lot of research and found that staying away from the microwave oven was a very good idea – she didn’t want any other abnormal cells floating anywhere near her. Ever since this time, I have also stayed away from them and now when I need something heated, I stick it in the oven or I heat it up on the stove – it takes a few minutes longer, but at least I’m not injecting my fresh food with any abnormal cells. If you’re one to use the microwave on a daily basis I would think about cutting back. If you’re using it at work to heat up lunch then try bringing a lunch that doesn’t need to be heated, a.k.a. salad or a sandwich. There are ways to get around it but it may require a change in your daily routine. Knowing the facts about controversial topics is very important. You need to be in control of what goes into your body. I hope this post gives you a little bit of insight into a whole topic that doesn’t usually get brought up at the dinner table. Remember: the truth isn’t only what you see, but it’s also what you DON’T see. Stop those voluntary abnormal cells from growing and maybe our cancer rate will plummet! Bathing Under Flourscent Lights Got You Down? For those of you who wake up in the morning and dread those 8 hours of sitting in an office bathing under fluorescent lights – I completely understand. I too am in this lovely position all-day and only find comfort and excitement when I write a blog post or spend time coming up with a new recipe to try. It’s the small things that I do for myself during the day that actually get me through. SO if you find yourself in the same position as me – don’t consider yourself stuck – just find a way to bring what you like and what makes you happy into your workspace. Just remember that you’re NOT alone and there are lots of people who are in the same boat as you. The trick is to find your way out – how can you make your exit strategy as painless as possible? Remember that this is YOUR life and your time is precious. If you don’t like your job take time for yourself to figure out what you do like and make it work. Your passion CAN be your job. I know its hard to make any sort of change or transition – I’m going through it right now – but I know once the initial plunge is over then it will all (hopefully) be smooth sailing from there. I try to stay as positive as I can and I definitely recommend the same for you. I hope the rest of your week is filled with happiness… you deserve it. This morning I woke up all anxious – what a terrible way to start my day… As soon as I opened my eyes and even before, I had all these thoughts rolling through my head – I was obsessing about ridiculous things. These are the types of thoughts that kick my stomach down and make it super hard to pick myself back up. Well, I decided that I wasn’t going to start yet another day this way and I put an end to it. I walked up the stairs, took out my yoga mat and started practicing yoga, which I’ve learned from numerous teachers around NYC. I figure you don’t need to be a yoga teacher to practice yoga in your own home. You wouldn’t believe how much this helped me. For the 10 minutes that I was practicing, my breath began to get heavy and all of a sudden my muscles loosened up, my back felt great, and I was simply amazed. It took 10 minutes from my morning routine and I made it work so that I wasn’t late for work. I’ve decided that this will become part of my daily routine and I recommend this for everyone. If you’ve been to a few yoga classes then your all set, just try to remember at least 1-5 poses and you will be ready to practice on your own. If you’re not into doing the poses on your own, sit cross-legged with your hands resting on your legs and palms facing up – begin to focus on your breath – hear it, feel it, be it, live it, enjoy it.